Continuing with my blogging about other WAHM (work at home mom) businesses, I want to introduce you to Lautzy Soap and its sudsy proprietor, Jennifer. Jennifer started making natural bath products for her family, in order to deal with sensitive skin and eczema issues. 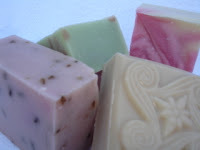 I know at our house, handmade soap has worked wonders with our daughter’s all over eczema, so I am intrigued! Add that Jennifer really listens to her customers and is inspired by their needs and feedback (as well as by her 2 children!) for creating original products (like DIRT soap ~ yep, Dirt! ), and you have an appealing business model. As a WAHM Jennifer most enjoys dealing with customers and finds bookeeping to be her least favoured task~ despite an accounting degree! Her newest skill challenge to is to master the tricky work of creating liquids soaps and gels from scratch. in the Army of working to shut down an old nuclear power plant. She kept finding dead animals, a definite sign of a chemical environment! Yikes! goodies that are good for you! Be sure to check out Jennifer's scrubs and pampering packages as well as her soaps!